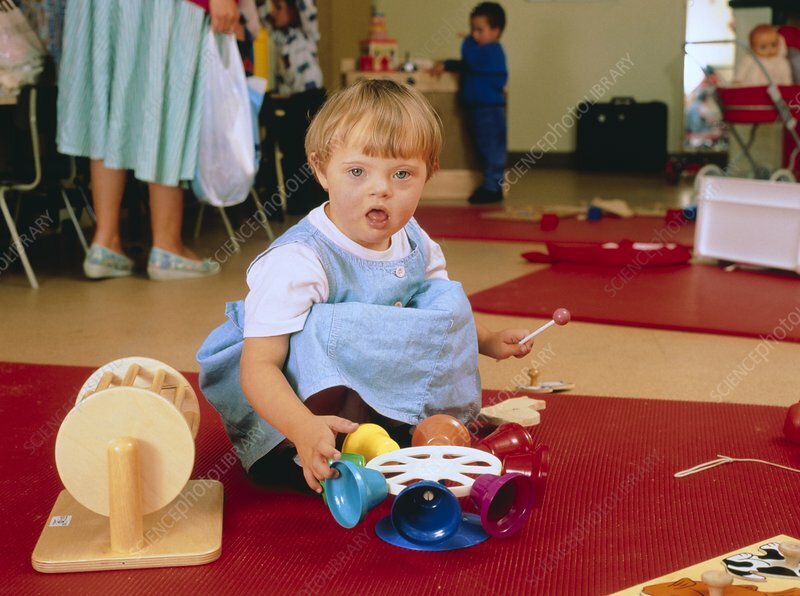 A young girl with Down's syndrome. Down's syndrome (also known as trisomy 21) is a form of mental subnormality due to the presence of an extra number 21 chromosome. The main physical signs are slightly slanted eyes, a round head, flat nasal bridge, fissured tongue and generally short stature. The ultimate mental attainment of a Down's syndrome sufferer is normally an IQ in the range 50-60 (equivalent to a five-year old child). Many physical features are apparent at birth, but the disease may commonly be diagnosed before birth by amniocentesis. Occupational and other therapy may eventually lead to the sufferer gaining some degree of social independence.